The Friends of Manatee County Animal Services has had a mission to work with the county agency to provide additional resources, medical care, and heartworm treatment for the shelter’s animals since the Friends was organized almost 2-1/2 years ago. The Manatee County Animal Services facility is located at 305 25th St. W., just north of Palmetto. Animal services also operates the Cat Adoption Center in downtown Bradenton. Friends of Manatee County Animal Services board member Lori Gurley holds a special print to be included in the swag bags that will be given away at the organization’s Casino Night fundraiser. 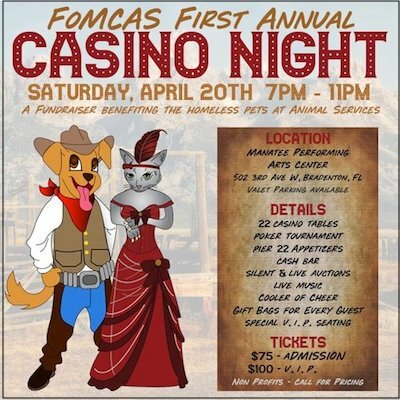 “We work hand-in-hand with the shelter to provide medical and enrichment programs for the animals,” said West Bradenton resident, Katie Rose Howard, who is a board member of the Friends organization and chair of the group’s First Annual Casino Night fundraiser, to be held from 7 p.m. to 11 p.m., April 20, at the Manatee Performing Arts Center, 502 Third Ave. W. in Bradenton. The 501c3 nonprofit charitable organization raises money through donations, fund-raising events, and sponsorship programs. She emphasized that 100 percent of all donated funds goes toward programs for the shelter animals. Guests of the Casino Night fundraiser will have an opportunity to win at their favorite gaming table and enjoy an assortment of hor d’oeuvres. Pier 22 restaurant will provide the food catering, and there will be three cash bars. 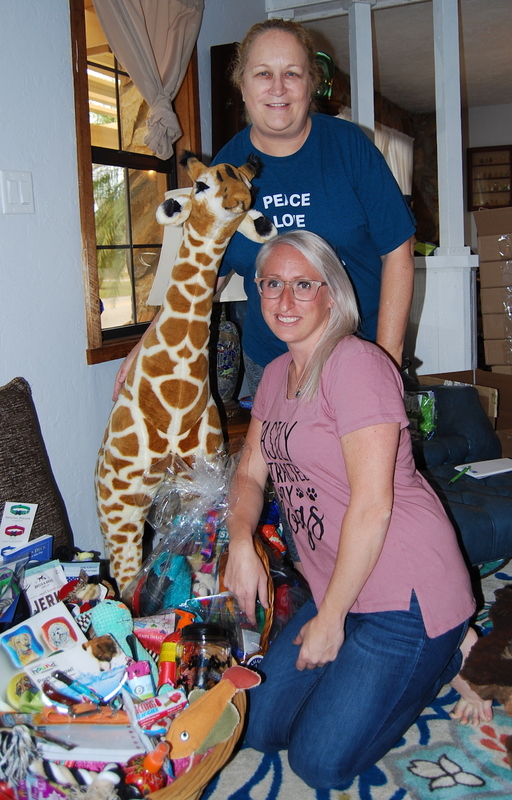 Friends of Manatee County Animal Services board member Caryn Hodge, standing, and Katie Rose Howard show off a stuffed giraffe, which will have free tickets to the Naples Zoo and will be raffled off at the organization’s Casino Night fundraiser. Guests will be able to bid on the silent and live auctions, and with the chips they win at the casino tables, they can purchase raffle tickets for gift baskets, gift cards to local restaurants and businesses, and a variety of other prizes. The silent and live auction items include signed sports memorabilia, tickets to area sporting events and attractions, and resort getaways, including a two-night stay at Treasure Island Hotel and Casino in Las Vegas. “The whole community stepped up to donate something for Casino Night,” Howard said. 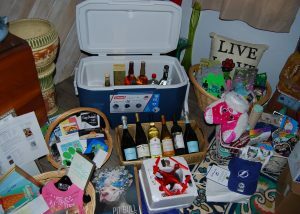 During a recent Casino Night committee work meeting, the living room at the Snead Island home of board member and event co-chair Brian King was filled with gift baskets and raffle prizes, with Howard, Lori Gurley, and Caryn Hodge also helping to organize them. “All of the Tampa Bay sports teams donated something,” Howard said. These items include a No. 55 Braydon Coburn-signed official Tampa Bay Lightning hat, a football signed by Tampa Bay Buccaneers linebacker No. 54 Lavonte David, and four game tickets to a Tampa Bay Rays game. “And the Pittsburgh Pirates and Bradenton Marauders are putting together a basket for us,” Howard added. General admission tickets are $75 and include playing chips, one free drink ticket, and a swag bag. VIP tickets, available for $100, include two free drink tickets, a swag bag, and access to special VIP seating. Caryn Hodge, left, Katie Rose Howard, Brian King, and Lori Gurley, the event organizing committee for the Friends of Manatee County Animal Services Casino Night fundraiser, recently met at King’s house,and with the help of King’s three dogs, put together the raffle prizes and gift baskets. Guests are encouraged to dress in their best western attire for the Dodge City Saloon Casino theme. Mutt Dillon and Miss Kitty will be there in full costume to greet the guests, and TapSnap will provide photo booths to capture all the fun. Cocktail hour attire is also acceptable. King, who moved to Manatee County from Orlando 18 years ago, said that he has had dogs his entire life, and when he retired from a healthcare job, he began volunteering at the county animal shelter. “I work with the fearful and shy dogs to make them more adoptable,” he said. According to the WebMD website, heartworm is transmitted to a dog through the bite of an infected mosquito. Once the larvae matures into an adult heartworm, which can take up to seven months, it lodges itself into the heart, lungs, or blood vessels of the animal and begins reproducing. 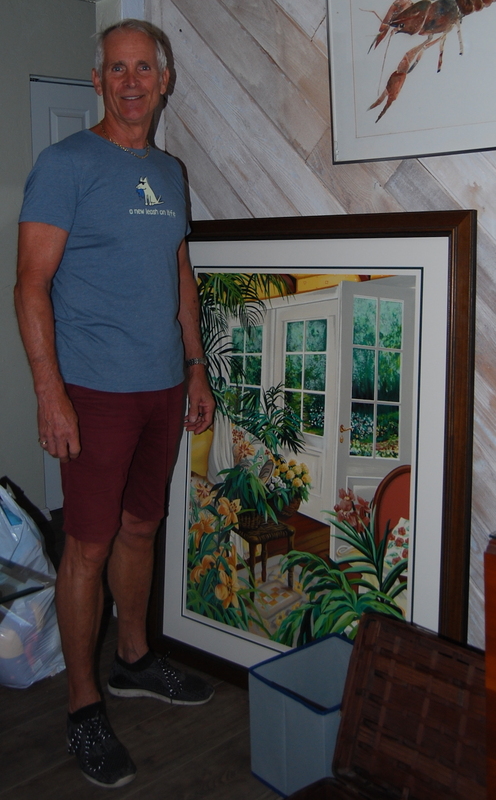 Friends of Manatee County Animal Services board member Brian King stands next to an original painting that will be auctioned off at the organization’s Casino Night fundraiser. King said the Friends group also provides other services that make life for the animals at the shelter better. “We have some animals that were hit by cars, and we have the funds to send them to Dr. (Scott) Rose, an orthopedic veterinarian in Sarasota,” he said. 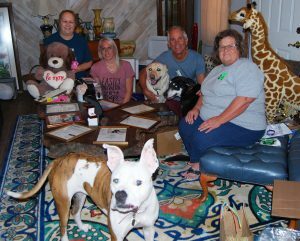 Palmetto resident and Friends board member Gurley explained that the Friends of Manatee County Animal Services was founded in October 2016. She pointed out that the organization was modeled after the Friends of the Central Library. Officers and a board of directors run the group. 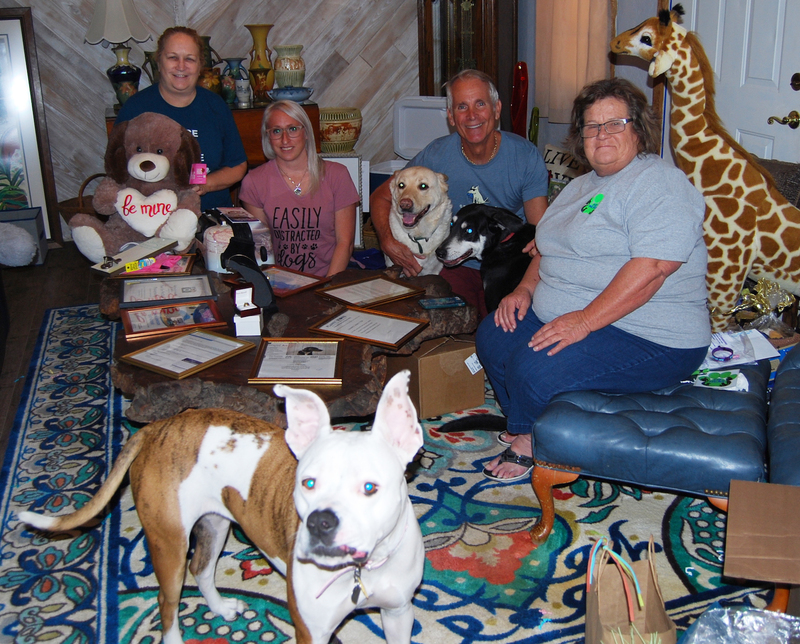 Although there is no formal membership list, the Friends of Manatee County Animal Services welcomes volunteers to help with events, outreach, and fundraising. Having an animal as a pet is not a requirement for volunteers, but probably all of them are animal lovers, just as the four events committee members are. “We are all animal lovers and devoted to make things better for animals without homes,” King said. 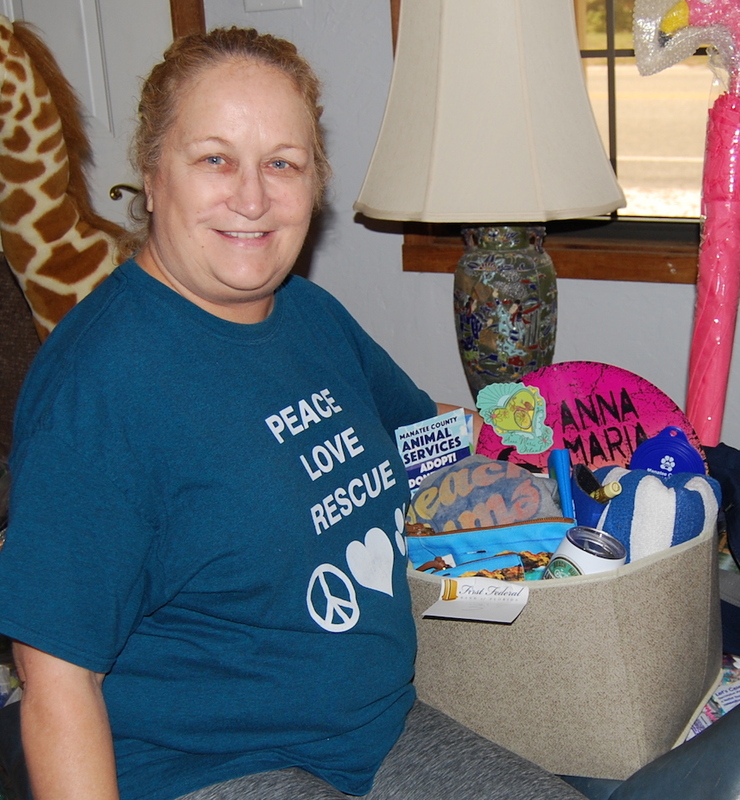 Friends of Manatee County Animal Services board member Caryn Hodge holds a gift basket she put together for the organization’s Casino Night fundraiser. Howard, who is an insurance agent at Insurance Time in Bradenton, has three dogs: Peebles, who is 8 years old; Marshmallow, who is 5; and Minnie, who is 4. All three are rescue animals. “I feel a lot of times shelter animals are forgotten and need a voice,” she said in explaining why she is involved with animal rescue activities. Gurley, who works for a Sarasota builder, also has three dogs: Molly, who is a 14-year-old boxer-pit bull mix; Louie, who is 6 or 7 years old; and Katie, who is about 5 years old. 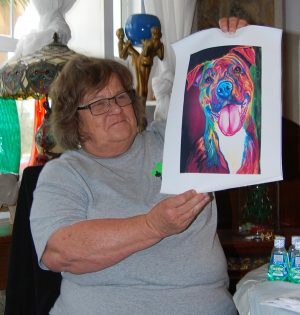 Hodge, who has always been an animal lover, described her involvement with the shelter: “Eight years ago I started an organization to take pictures of the animals in the shelter to put online for adoption,” she said. “I asked friends who were photographers to volunteer to take the photos so the animal would be seen in a better light. Some of the prizes and gift baskets, including an ice cooler of alcoholic beverages, that will be auctioned or raffled off at the Friends of Manatee County Animal Services Casino Night fundrasier are on display. For more information about the Friends of Manatee County Animal Shelter and the Casino Night fundraiser, visit its website at www.FOMCAS.org.